Yulia Lipnitskaya of Russia performs during the figure skating team event at the Iceberg Skating Palace during the Sochi 2014 Olympic Games on Feb. 9. Just watching Russian wunderkind Yulia Lipnitskaya, even from a firmly immobile spot like the couch, is enough to make you dizzy. 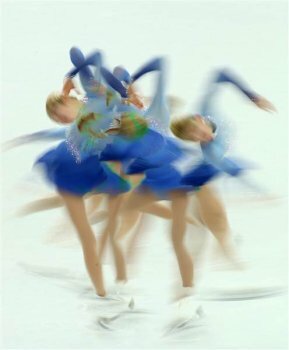 If you’ve been following Olympic figure skating in Sochi, you know that these athletes have the uncanny ability to evolve into a sequined blur, spinning as many as 40 times during a single trick. That means they can’t “spot” like dancers do, keeping their heads in the same orientation while they twirl rapidly in place. Fixating their eyes on one point is simply impossible. “When we talk to different athletes about training, that’s always the first question they ask us, ” says Alex Shibutani, American ice dancer on the 2014 U.S. Olympic Figure Skating Team, who performs in pairs events with his sister, Maia. Indeed, figure skaters do get dizzy, but they handle it with much more grace than seems humanly possible, land or ice. Luckily for them, they’ve got a bit of physics on their side. In a scratch spin, one of the most recognizable figure skating moves, both arms and one leg begin extended outward. As the limbs are gradually pulled into the body, the skater’s spin accelerates rapidly. The smaller the diameter of the circles etched into the ice, the faster they go. The purpose of making one’s body straight as a rod is not just to sneak in more revolutions, though that certainly helps rack up judge’s points. Mostly, it’s to keep the head aligned with the rest of the body. This is especially important for our vestibular system’s ability to keep us balanced. A multiple exposure picture of American Gracie Gold performing in the figure skating team event at the Iceberg Skating Palace during the Sochi 2014 Olympic Games on Feb. 9. The vestibular system is perfectly designed for our three-dimensional world. Located in our inner ear, this sensory system is composed of three semicircular canals situated at right angles to one another. These canals allow us to detect movement horizontally (like shaking our head left to right), vertically (nodding), and along a frontal plane (like when performing a cartwheel). If you’ve ever had the sensation of vertigo, you’ve experienced a problem with your vestibular system. Each semicircular canal contains fluid called endolymph. When one moves their head, the endolymph displaces tiny hair-like cells, which translate movement into electrical impulses and let us perceive our relationship to the world around us. There are two moments during a skater’s spin during which they feel dizziest. At the beginning, as they are picking up speed, their endolymph lags behind. Then toward the end of their spin, the body’s inertia keeps the endolymph moving quickly, even though everything else is slowing down—kind of like how your keep moving forward right after you slam on your car’s brakes. In the middle of the spin, however, when the body and endolymph are moving at the same speed, skaters are on cloud 9. Evgeny Plushenko of Russia performs in the figure skating team event at Iceberg Skating Palace during the Sochi 2014 Olympic Games, on Feb. 9. You may notice that figure skaters don’t go into any fancy jumps or balancing acts right after coming out of a spin. Another coach’s trick is to stare at a fixed point in the distance after slowing down, much like a nauseated sailor might focus at the horizon to orient themselves during a particularly rocky expedition. “I don’t think that the dizziness ever goes away. You just get used to it, ” says Shibutani. Most of it all comes down to one word: practice. And lots of it.